The Opel Speedster is one of the few sports cars Opel has made in its long history. The limited edition makes it a car of which not many drive around. Therefore, if you are looking for a way to have a windscreen replacement for your Opel Speedster, this can be a tough job. Fortunately, you can easily order new car windows through us, so that you can safely use your car on the road again. Replacing the Opel Speedster windscreen is an expensive business at a brand dealer. By offering after market vehicle glass we can keep the prices for you much lower. 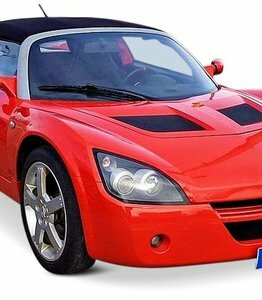 In this article we will tell you more about the possibilities to cheaply replace the windscreen of your Opel Speedster. Before that, we will go into the history of the German car brand Opel and tell more about the more sporty cars that this brand has made. started up a company in 1862 to produce sewing machines. Although he was to become a locksmith at first, his interest in sewing machines was aroused in Paris. He decided to rent an old cowshed from his uncle in his home town of Rüsselsheim am Main in order to start up his business. The products of Adam Opel soon became a great success. Within 20 years of its foundation, Opel became Germany's market leader in sewing machines. Meanwhile Adam Opel was married and he had five sons with his wife Sophie. Under the influence of his sons, the family business also started to produce bicycles. In this area, too, the company excelled. This was partly because the already used and then modern production methods were applied to both products. Adam Opel died relatively young, at the age of 58, in 1895. His sons and widow took control of the company. At the same time, Opel had already become the largest producer of bicycles in Germany. What is special is that Opel's head office is still in Rüsselsheim am Main and that, under the influence of Opel, the city has become an important place in Germany. in 1909. What was special was that the price of this car was about half that of most other cars at the time. Opel learned at an early stage their best position on the market: high quality mid-market cars at fair prices. A fire at the Opel factory in 1911 had a positive impact on the company in retrospect. Everything was destroyed and therefore a whole new factory had to be built. At that time it was decided to invest and to apply the latest production methods. This gave Opel a head start over many other carmakers and allowed them to quickly engage in mass production. As a result, Opel's prices were lower than those of many other carmakers. For many people it became possible to buy a car from Opel. They have therefore been important in popularising cars among 'the normal people'. and the Opel Ascona also performed very well. From the period after the Second World War up to and including the 1980s, Opel was extremely successful and profitable. In addition, General Motors had several car brands and there were many synergies. Several models were sold all over the world under various brand names. The use of basic platforms on which the different brands could make cars was also a success. After that it gradually went downhill with Opel. 1999 became the last year in which Opel made a profit. In 2017, Opel was therefore acquired by the PSA Group and, after almost 88 years, the partnership with General Motors ended. followed between 1971 and 1974. However, only 127 of these were made. Opel's third sports car is the Opel Speedster. The Opel Speedster was released in 2000 and was available until 2005. In that period, almost 8,000 of them were sold. The Opel Speedster is designed and made by Lotus and therefore has many similarities with the Lotus Elise. This is because Lotus needed money in those years because of stricter safety requirements. General Motors was prepared to invest this, but wanted to get a car back for it. This became the Opel Speedster. This small sports car has an aluminium chassis and is therefore very light. The normal Opel Speedster weighs only 870 kilos, while the Speedster Turbo with 930 kilos is not a heavyweight either. Combining the light weight with an engine that produces between 147 and 200 hp, the Opel Speedster is quite a fast car. The top speed of both versions is above 215 kilometres per hour. The Opel Speedster was sold in the UK as the Vauxhall VX220, making it one of the few modern models to have a different name at Opel and Vauxhall. The same Lotus Elise base of the Opel Speedster was later also used to make the Tesla Roadster. The Opel GT was sold from 2007 to 2009 and has been Opel's last sports car for the time being. The windscreen replacement of your Opel Speedster is required in the event of a multiple crack in the windscreen or a crack in the driver's direct view. This is because the crack affects the stiffness of the car window. As a result, there is no optimum protection for the occupants. Light from the sun or from oncoming vehicles, for example, can also reflect through the crack and cause glare. Replacing your Opel Speedster windscreen is necessary because it is not possible to repair a crack. This is because the front window of the car is made of laminated glass. These are two layers of glass with a layer of PVB film in between. If a crack occurs it cannot be repaired by this layered construction. The Opel Speedster windscreen replacement is often an expensive operation for a brand dealer. This is because only brand dealers are allowed to sell car windows with a brand logo. This exclusive right makes it possible for brand dealers to charge a higher price than is necessary. Cheap windscreen replacement for your Opel Speedster is possible by ordering your car window here. The after market car windows that you can find on this website are of exactly the same high quality as car windows that the brand dealer sells. However, due to the absence of a brand logo, there is free market operation and the prices are considerably more advantageous for you. It is possible to replace the windscreen of your Opel Speedster by ordering a separate car window from us without assembly. Many other competitors do not give this possibility. If you don't have the knowledge to replace the Opel Speedster windscreen yourself, our FOCWA certified partners are ready for you with enthusiasm. They even replace the windscreen on location, which saves you travel time and costs. Your Opel Speedster will then be ready to go safely on the road again in the shortest possible time. Ordering a new car window is quick and easy. Choose the highest quality and the best price when it comes to windscreen replacement of an Opel Speedster.